Make Your Schedule Work. Leave Time for Fun! 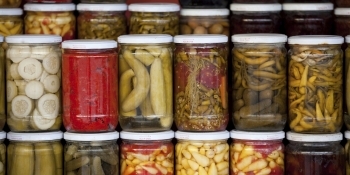 Think carefully about which tasks should go in your pickle jar. Pickle Jar Theory* uses the analogy of an empty pickle jar to show how we use the fixed amount of time available to us each day. If we think of it as we plan our schedules, we can get important work done while still leaving time for the small things that make life fun. First, forget about time management altogether, and just imagine that you have a huge empty pickle jar (think of the largest pickles you have ever seen). Now, imagine filling the jar with golf balls. And, when you get it to the point you think it can hold no more, try adding another golf ball or two. Even though it seems full, you're not done yet. You're going to now squeeze in a handful of marbles. Give your pickle jar a shake and as the golf balls and marbles start to settle and create more room, add in a bit of sand. Now, fill your pickle jar to the tip-top by adding back in some of the pickle juice. Now, back to time management.